A great tradeshow giveaway that has heart! 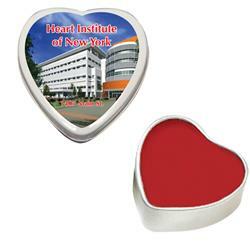 All natural Beeswax formula U.S. made premium Lip Moisturizer in a heart tin.. Price includes cherry lip balm in a white tin with a one color direct imprint or four color laminated decal. 1000 unit minimum for other lip moisturizer colors or flavors. Inquire for rush! Available Colors: Silver Tin, Red Fill. 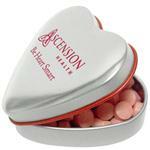 Dimensions: 1 7/8" x 1 7/8" x 7/8"
Typical Imprint Area(s): 2.32" x 2.17"
All natural Beeswax formula U.S. made premium Lip Moisturizer in a heart tin.. Price includes cherry lip balm in a white tin with a one color direct imprint or four color laminated decal. 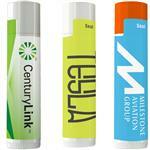 1000 unit minimum for other lip moisturizer colors or flavors. 250 carton / 20 lbs.